The Dynafact Manufacturing System (DMS) | Dynafact Software Inc.
Dynafact is a Software development and services company dedicated to helping our customers Increase Throughput and Reduce Waste! 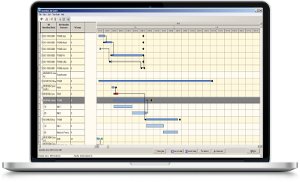 The Dynafact Manufacturing System (DMS) is a sophisticated Advanced Planning and Scheduling technology designed to complement your ERP system or function as a stand-alone solution for complex "job shop" environments. Most discrete manufacturing environments are far too complex to manually coordinate and calculate all asset capacities and load demand. As a result, spreadsheets and other Infinite based planning systems depict high level shop load ‘buckets’ with no consideration for specific demand spikes, equipment or skill sets that can easily become bottlenecks. Even if you can get close, something always changes! 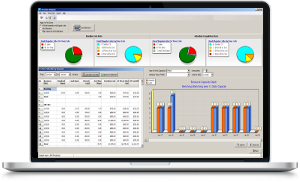 The Dynafact Manufacturing System replaces these rudimentary systems and integrates planning, scheduling and plan execution into a powerful finite production tool giving you the power to Plan, Predict and Control! Please watch this short demonstration on just some of the capabilities of the DMS technology. Learn how to evaluate cost/benefits to Identify, Exploit and Subordinate Bottlenecks to increase on time delivery! Reduce Waste and maximize Throughput by focusing on the true “Value Drivers” of your business! DMS models simple to very complex job shop environments and schedules thousands of work orders in minutes, enabling you to perform quick simulations in order to answer key production questions. The Dynafact founders have over 50 years of experience developing and deploying Advanced Manufacturing Solutions giving our customers the ability to Plan, Predict and Control every shop order in your project’s work-flow. We are committed to each and every customer by ensuring they have the tools they need to Reduce Waste and Improve Throughput! . Deltek, a leading provider of enterprise applications software built specifically for project-focused businesses. Deltek provides an interface to the Dynafact Manufacturing System. Please contact us for more information on the Deltek interface. Copyright © 2019 Dynafact Software Inc.